Gimmicks. You know, those little (or something big) things that attract people to make a purchase of some sort. Generally, these gimmicks tend to overshadow the actual product itself. It is quite possible that the product is not really all that special... Hey, it's marketing and many people fall into that trap everyday. How about a crappy plastic clock if you sign up for a Visa? Or a cooler bag when you get a Vancouver Sun subscription? Oh, and the best one of all: "if you call within the next hour, we'll double your order of GLH!". Oh the gimmicks... Generaly, I consider myself savvy in this respect, but even with that being said, I occasionally fall victim to gimmicks too. Call it human nature, or possibly by being a man, I get distracted with shiny things. 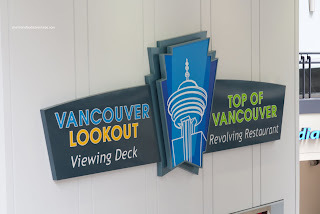 So going into our brunch at Top of Vancouver Revolving Restaurant, I already knew the view would probably be the most attractive feature of the place. Yet, we went in with an open mind to see if anything else was worth remembering. We arrived early and they were still setting up most of the food. I contemplated on tackling the Salads and Cold Seafood first since they were ready. In actuality, I only went for the seafood... Salad? Pffft.... 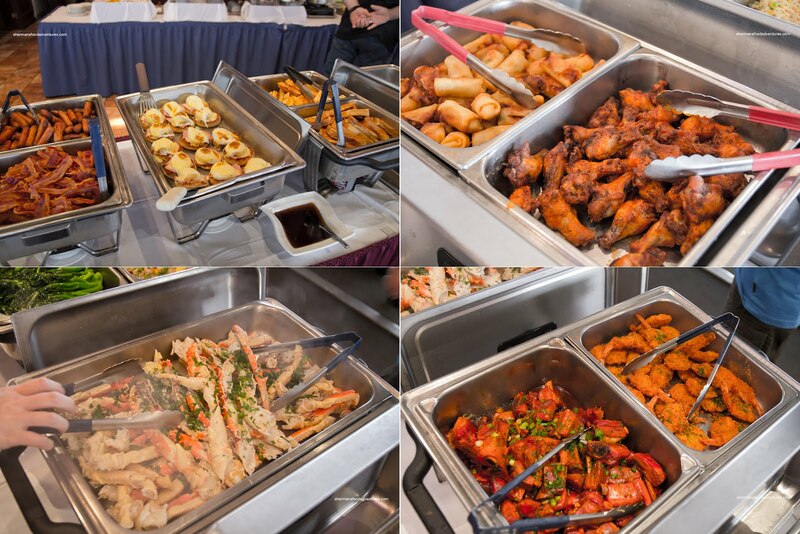 If you look closely at the small picture on the bottom left of the first box, you'll see a plate of herring. 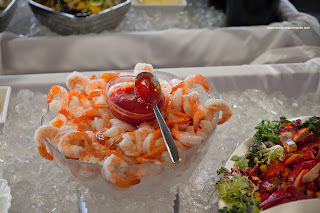 Well, halfway through the meal, it was replaced by cocktail shrimp. Little did I know, this would be the theme of the entire meal - appearing and disappearing food. So if you were not lucky to pass by the buffet while that particular dish was there, you'd never see it again. Good for variety, bad for those who want to try every item. Th e obligatory plates of Sushi were pretty average at best and only served for variety purposes. Onto the hot food, we had the standard breakfast meats, Eggs Benedict and waffles. Notice the slight browning on the top of the Benedict, that actually messed up the texture of the sauce (which was actually weak). The egg was poached perfectly runny, but the English muffin was too crunchy. Moving along, there were some spring rolls and Chicken Wings. I liked the wings as they did have a kick (along with a good balance of salty and sweet) and were not terribly overcooked either. They were rather greasy though. The Crab Legs were a crowd pleaser but they were dry and salty. The Short Ribs were a touch dry and quite sweet while the Fried Butterfly Shrimp were crispy (so I heard because when I went back for some, they were gone and to be never replenished). The new stuff consisted of some Poached Salmon with couscous & tzatziki. The dish lacked flavour, however, the salmon was not overcooked. Another fish item was the Seafood Stuffed Sole. The sole was cooked nicely while the seafood filling was mushy. There was good flavour from the good hits of lemon. Seeing how the kitchen staff (and the whole staff in general) were predominantly Asian, it was no surprise that the Fried Rice was pretty good. Oh and the side of Gai Lan next to it too. 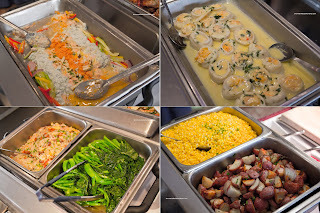 There was some corn and roast potatoes in the buffet line, but I didn't bother with them. While we were eating, we saw some people with huge scallop shells on their plate. At first, we thought they were steamed fresh scallops. 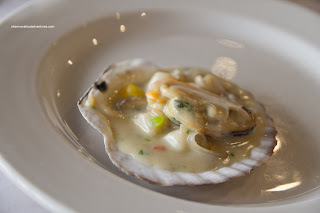 To our dismay, they were only shells holding a Kiwi mussel with some little scallops in a starch-thickened cream sauce. 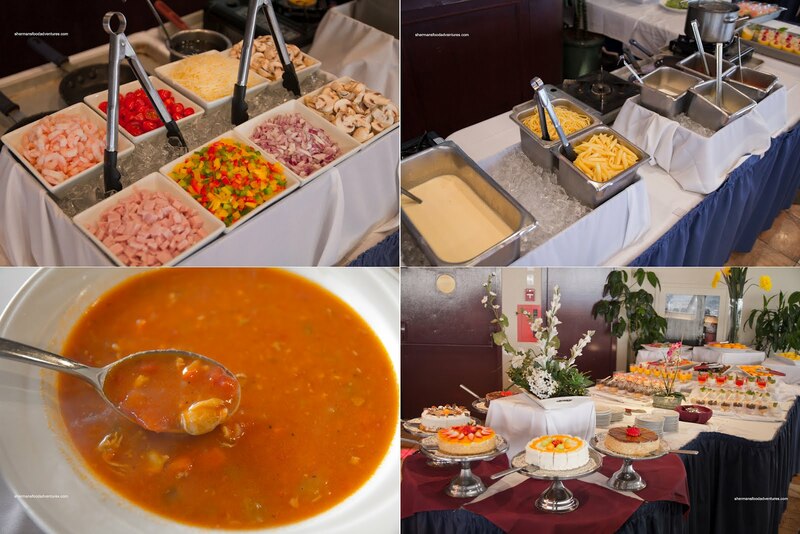 There were 3 stations on the inside portion of the buffet line that consisted of Soups, Omelet Bar and Pasta Bar. The soups were Manhattan Clam Chowder and Cream of Mushroom. I'd have to say that it was a good cafeteria-style clam chowder, but hardly representative of the type of establishment TOV intends to be. The cream of mushroom was not bad as it was very Earthy and rich. There was also a carving station with a well-prepared Prime Rib. It was mostly medium-rare (not pictured). 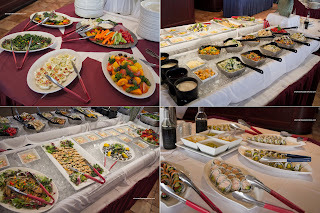 Lastly, a decent-sized spread of Desserts met us at the end of the buffet. Theses were pretty typical cakes and little bites found at these types of Sunday brunches. Nothing really stood out. And really, that is probably the best way to describe the food. It was pretty darn average. The main attraction is truly the view and to a lesser degree, the good service we received. Consider it a $42.95 buffet which includes the $15.00 ticket up to the observation deck at Habour Centre. In that case, it is really a $27.95 buffet. 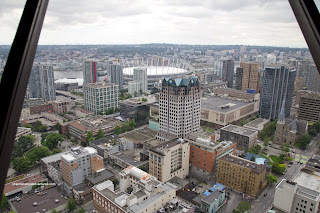 How much for a dinner at revolving restaurant.